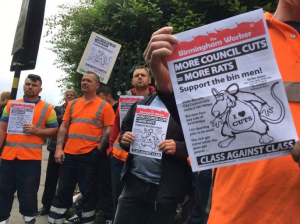 The Birmingham bin men fighting to preserve the 113 safety-critical Grade 3 jobs currently under threat have now been stitched up twice. First they were hoodwinked by promises made at ACAS by the then-leader of the Labour council, John Clancy, promises which the council promptly reneged on once Unite lifted the strike, issuing redundancy notices to all the Grade 3’s. Then, three weeks after the strike resumed, the High Court served an interim injunction to stop the council enforcing redundancies, with a ‘jam tomorrow’ promise of a trial in the back end of November to decide whether the council was acting unlawfully. Sure enough, on this pretext Unite once again suspended the strike, breaking its momentum. Without benefit of clairvoyance, the Birmingham Worker, publication of the local branch of the CPGB-ML, was able to predict, on the eve of the court judgment, this very course of events, saying that “we fully expect the High Court to cobble together a decision that will enable both Unite and the Council to claim some sort of victory”, and warning that, “as with the fiasco of the ACAS deal, it is only right and proper that the workers vote on whether to accept such a deal and return to work. The decision cannot be made on their behalf by officials and stewards alone. Furthermore, any deal that delays the demands of the workers should be challenged until the Grade 3s are given a cast iron guarantee that their job is protected.” Whilst it tasted sweet, the public dressing-down administered to Clancy by the High Court judge is not enough. The bin men want their jobs back. At the Birmingham rally on the Sunday preceding the court judgment it was notable that, whilst Len McCluskey and other lesser union notables were given free rein to repeat ad nauseam the identical message (‘shame on John Clancy, but well done the lone Labour councillor anonymously supporting the rally, and let’s not forget to vote Labour’), little was heard from the bin men themselves. This anomaly was at its most glaring at the conclusion of the rally when all the bin men were invited up onto the podium but not one was invited to speak! Through struggles like that undertaken by the bin men, the working class can learn to reclaim its voice and its power. And as and when it does so, the CPGB-ML will stand ready to offer the ideological leadership which will be urgently required as the crisis of capitalism ripens.